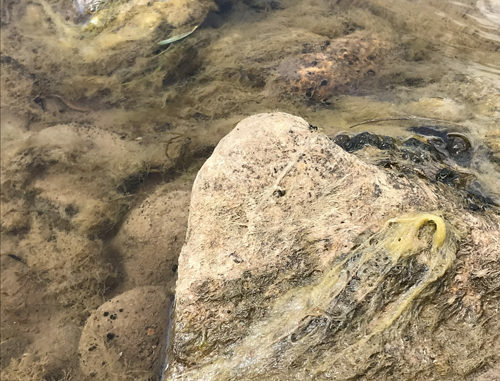 RBC | As you may have noticed, algae in the White River is growing quickly and early this year due to low water levels and warm temperatures. There will be several algae study activities happening over the next few weeks. White River Algae Technical Advisory Group is working with Colorado Northwestern Community College (CNCC) to get pictures of the algae from the air. Annual flights will be helpful in determining if algae is moving up river and if it is more abundant in some locations than others. USGS staff will be out collecting data on the algae this month as well. The photo portion of the project will be used as an opportunity to help CNCC students learn how to fly drones while helping the community find the causes of the excessive algae bloom. The pictures collected for this study will be used strictly for studying the algae. We anticipate flying the river during the week of July 16 or shortly thereafter. The White River Conservation District staff is contacting landowners along the White River above Meeker this week to discuss this effort. If you are a landowner with land along the river and have not heard from the district staff by Friday, July 13, it is likely that we do not have contact information. We ask those landowners to contact our office at 878-9838 with any concerns. RANGELY — Steve Swymer remembers the first time he stepped foot in northwest Colorado. It wasn’t quite the reception he was anticipating.